What Are You Doing Sunday, Baby? No, you are not at the wrong blog, and I am not reliving the popular hit song by Tony Orlando and Dawn which I sang at my father-in-law's 90th birthday party last weekend. I am referring to this Sunday, today, which is PBS Sunday. This is a long awaited event which we started planning since last October when we 'booked' the date and the speaker, Rev. Ong Hwai Teik, our Trinity Annual Conference President. The specialness of today is that it is our anniversary Sunday and it is also the LAST Pusat Berdikari Seremban's Sunday. 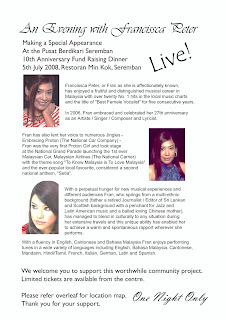 Next year it will be recognized by the church as Persatuan Berdikari Seremban's Sunday. Please remember the difference although the work are the same. Rev. Ong preached on the topic 'A Church Worthy of the Gospel' from Acts 2:37-47. The church need to grow up, grow together, grow out and grow more. We in the church do not serve as volunteers but as servants. It is a timely reminder on this PBS Sunday to we who give of our time at the centre that we do not volunteer per se but willingly give of what we are good at for the good of the trainees. Even as he ended by saying that a church must not only be good but look good so that outsiders like what we are doing, he reminded us to be members who are united, informed of our calling, spiritual in our thinking and witnessing the Gospel to the world in need of salvation. When this is applied to PBS it bear a parallel call for us to do the same as we do as a church. The PBS Sunday ended with a breakfast and the cutting of the 10th anniversary cake donated by a bakery. Here are some pictures of the celebration. Tony and I were shocked to see the whole Restoran Min Kok FILLED to the brim with 170 tables for a grand dinner function tonight. It is a record of sorts for the restaurant which is anxious how to manage the food service with many temp waiters employed. It makes me glad that our size is a lot more manageable. We confirmed the number of tables with Min Kok so that they can go ahead to order the food. Michael Chow of Music Power Sound Team whom we engaged to set up the sound and lighting systems met us to finalize the positioning of the speakers and LCD screens. And a timely reminder to William Khoo, the videographer, to show up to record the evening's event. It was also a pleasant surprise to see a budget hotel a stone throw from Min Kok. The Golden Inn has day rooms that we can use to allow Francissca a proper place to have her make-up done as well as rest a bit after rehearsal. It looks like we are all set. I am pleased with the smoothness of the planning and have to thank all the helpers for their unique roles. And God of course! That is the total dinner sales we've achieved. Not up to the 100 table target but a commendable effort for a small ministry like ours. I am not disappointed with the number which actually is a very good number since it will make the seating in the banquet hall a lot more spacious and comfortable, and hopefully also gives the guests a more enjoyable time. I am grateful to Mr Tan Fu Tee for offering his skills in planning the seating arrangement. He is our resident 'expert'. The 2 hours we spent this morning was most fruitful. Tomorrow I will be discussing actual sound equipment layout with the audio engineers, and on Saturday, a site meeting with all the helpers on the dinner evening. We are really on a Go-Go-Go! mood now. We all have some form of disabilities, they just show or not show up. If we confess that we are somewhat disabled, then we are more willing to see the learning disabled as one of us, not one of them. Who knows, they can teach us a thing or two about how to live! Who then teaches who? If being learning disabled cripples a person from earning a living, from living safely, from developing a healthy relationship as we who are not learning disabled, then not helping them when we can is like seeing a blind crossing the road and not doing something to help him cross safely. Somewhere there may be a learning disabled child or youth who you know, who need your attention. Do something to make his life worth the living. What is Learning Disability, Again? It is worthwhile to re-visit this subject since we are in the business (or service if you like) of managing (or helping if you like) people with learning disabilities (or slow learners if you like). I like this particular writeup from the Learning Disabilities Association of California (click HERE for more information) and have reproduced it below for your convenience. Learning disabilities (LD) are hidden disabilities that affect many individuals who usually have average or above average intelligence, but are unable to achieve at their potential. People from all economic and social levels may have unique learning differences. Estimates of the percentage of the school-age population who have specific learning disabilities as defined by the Education of the Handicapped Act of 1975 range from 5% to 20%. U.S.C. 1412: Section 1401 (a) (15) states: Specific learning disability means a disorder in one or more of the basic psychological processes involved in understanding or in using language, spoken or written, which may manifest itself in an imperfect ability to listen, think, speak, read, write, spell, or to do mathematical calculations. The term includes such conditions as perceptual handicaps, brain injury, minimal brain dysfunction, dyslexia, and developmental aphasia. The term does not include children who have learning problems which are primarily the result of visual, hearing, or motor handicaps, of mental retardation, or of environmental, cultural, or economic disadvantage." Individuals with learning disabilities can learn, but they learn differently. They need to be taught in a way that makes it possible for them to use their abilities to compensate for their weaknesses. Each individual with learning disabilities has a different combination and severity of problems. Specific learning disabilities are disorders in one or more of the basic learning processes involved in understanding or using language, spoken or written, or affecting the ability to listen, think, speak, read, write, spell, or do math. For many, undetected learning disabilities create a lifelong pattern of frustration and failure. Unable to learn to read or write adequately or to handle simple numerical calculations, they are forced into a lifetime of underemployment or unemployment. One of the serious consequences of learning disabilities is that young people who suffer from them do poorly in school unless they are helped. They tend to drop out of school and may fall into a range of antisocial behaviors. Independent studies show that adolescents with learning disabilities are more than twice as likely to wind up in juvenile courts as are their peers who do not have them. Research shows that about 40% of all juvenile offenders have learning disabilities and that most have never received any help for their disabilities. Other possible outcomes for individuals with learning disabilities who have not received appropriate intervention or help are low self image, teenage pregnancy, suicide, family instability, substance abuse, depression, significant psychiatric problems, and unemployment. They may end up on welfare, homeless, or in prison. Authorities agree that many individuals with learning disabilities are at risk of failure in school and in life unless their learning disabilities are diagnosed early and remediated correctly. Parents and professionals working together can help individuals with learning disabilities lessen many of life's frustrations and failures. Some of these problems can be found in all children at certain stages of development. When a child has a cluster of symptoms which do not disappear as she/he gets older, you might suspect learning disabilities. 10. to have an employer who will provide appropriate accommodations. 8. to learn to accept and value their children's or their own uniqueness. Are you passionate about helping the learning disabled? We may have an opening or role for you to play. Come and talk with us. It was a beautiful morning when 11 members of the Persatuan with Pastor Paul Christie and Mr Neil Rode (as advisors) and Betsi Peter (staff member) met at the Wesley Seremban church office at 10am to inaugurate the association. 8 other members sent apologies that they could not attend but we have enough quorum to proceed. The pro-tem chairman delivered his inaugural speech before he was elected into office as the first chairman of Persatuan. Following that was the election of 8 committee members which proceeded smoothly. We thank God for giving us a great start to this work and look forward to an exciting times ahead as we work as a team. This morning I went to the Hotel Royale Bintang Seremban with A. Kovalan and Michael Goh, two of the pro-tem committee members, to receive our Persatuan's certificate of registration at the official presentation ceremony in which we together with another 45 newly registered societies in Negeri Sembilan received our 'birth certificates'. The ceremony began with a briefing on 'Managing Associations' which was beneficial. Many questions were posed from the floor to the speaker. After a break the main event followed. The presentation was by the Registrar of Societies Malaysia himself, Dato' Haji Md Alias bin Haji Kalil, and ended with a buffet lunch. Here are some pictures taken. Yep, I received the dinner flyer in my paper this morning and I felt proud and great. Never done this before but I am feeling the power of publicity building up our social work. 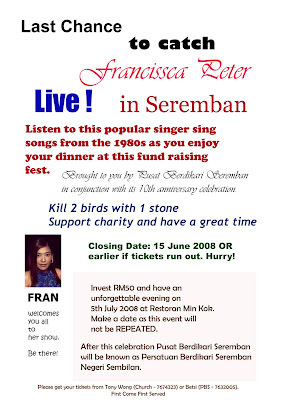 I want the 1200 English-speaking families in the Seremban 2, Bukit Kepayang and Rasah Kemayan areas who are receiving the flyers today and tomorrow to think about our work, and for some of them to pick up the phone to dial the centre this Monday morning to buy the tickets. What we can do we have done so I think the rest is up to God (though I think it is an unfair cliche to corner God this way). We really thank Him for the marvelous way He has brought our preparation to this point so smoothly. We will be happy with whatever the responses we achieve for the dinner night. Min Kok Restaurant assures us they will open up the sliding door into the common dining area to make the seating more comfortable. This will certainly be of great help. Next move: Dinner seating, souvenir magazine printing and audio setup for the evening. Feel the excitement? Birthing Persatuan means, among other things, setting up a bank account, which imply moving some funds over from Pusat Berdikari Seremban. Some formalities has to be observed, such as getting formal approval from the church and having a proper memorandum of understanding signed. It is like a son is leaving home. He is grown up but the parents wants certain conditions met before 'freeing' him. He senses the freeing is conditional, yet the son does not really want to leave home. Leaving is a natural consequence of maturing. Strings tied should be from the heart not from the hands. Otherwise it is not really an expression of 'Go, and may God go with you' sort of blessing. I'd prefer the church to be less head more heart. I hope I am not triggering a reaction? Yes, we have to learn to accept other opinions, just as others need to accept ours. It is incredible how supportive Betsi and David are to me during this anniversary dinner preparation. Without their hard work the preparations remain quite incomplete and delayed so I really appreciate their efforts. This morning David rushed off to the printer with the flyer artwork to be photocopied. I've asked for 1100 copies. Within the hour, soon after my leaving the centre, David stopped my car and gave me a bundle of the finished prints. Such efficiency is hard to match! So tonight I can pass them over to the newspaper vendor to have the flyer distributed this weekend. Thanks David and Betsi. Both of you are just wonderful, my left and right hands indeed. The last thrust to get the dinner ticket sales maximized has begun. With the promotion desk at a local popular mall out of question as they require a written request and time to reply, we don't have the luxury of waiting. So we are pushing sales through the newspapers as flyer inserts on this coming weekend which coincide with Father's Day. Maybe sons and daughters may feel urged to buy these tickets for their dads to dine and be entertained. I have to keep my fingers crossed and wait for the responses over the 3 days after that before we close our sale. 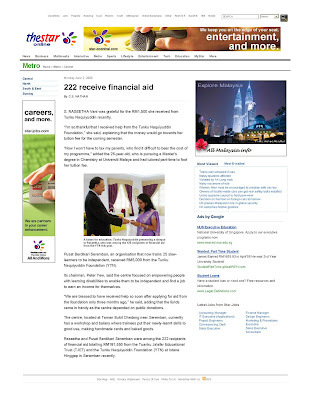 Someone has expressed concerns over possible abuse of funds and privileges once the Persatuan takes over the assets of its predecessor. It is a real concern and there are many associations that has succumbed to the temptations. Who is to blame for the slack and poor management? I would say the membership is responsible. 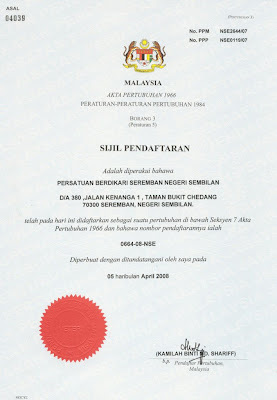 The rules of an association registered under the Societies Act of Malaysia require members to meet once a year under an Annual General Meeting or AGM to deliberate on the business of the organization. If necessary members can also call for an Emergency General Meeting or EGM to discuss urgent matters. The constitution can also be amended and any loopholes plugged to reduce possibilites of office bearers abusing their privileges or misappropriating the funds. It is therefore incumbent on members to read and understand the constitutions and to understand the nature of the work of the association so that they can safeguard the association from any misdeeds. Members are therefore guardians of the association, much like shareholders of a company. Their role is to protect the work of the association as if it belongs to them although they hold no personal interest. That is why I blogged awhile back that whether an association do well or otherwise depends greatly on who the members are. Having ill-chosen members can lead to much headache. On the other hand, 'quality' membership will definitely do a world of good to the association. The big question is deciding who are really good enough to be members, who are not. In this regard there are bound to be many opinions as well as disagreement. Personally I deem membership to be a privilege. While uncles and aunties are associated to a child not by choice, membership to Persatuan Berdikari Seremban is offered because the committee believes in the capabilities and skills of the persons invited. Dr Lim Boon Hock shared this lovely song over the pulpit before he preached in church this morning. As I listened I asked myself, don't we ALL need the Lord? 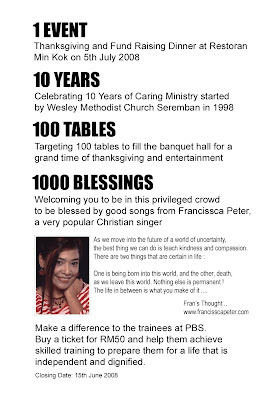 Don't the PBS trainees also need the Lord even though they may never heard of Him or know Him? Although we don't actively evangelize to them we can show the characteristics and personality of God, the loving Father, through the ways we help them at the centre. How can we help them if we are not there? 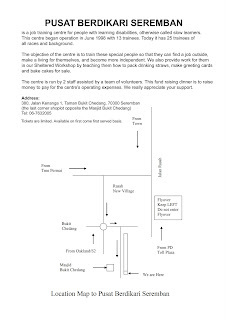 How can we be there if we don't volunteer? How can we volunteer unless we admit we have skills to offer? How do we recognize we have the right skills unless we respect and love ourselves? And how do we honor ourselves unless we agree that we are a person who have the capacity to do good? Completing the big circle, we realize we really need the Lord to know who we are and how we can make a difference. Even to ourselves. You'd be surprised! A growing child needs an environment of discipline, love and support. Parents are often the main source of interactions and upbringing to the child and he is molded by the values parents impart on him. Yet a family without relatives to help the child grow is handicapped to an extent because uncles and aunties who have vested interest in the child's growth also help him realize that there is another world beyond his father and mother. His growth is that much enriched when uncles and aunties visit and share goodies with him or bring him out to play or have some fun. The Persatuan scenario may not be exactly like what I've just painted but similar. The committee members are the parents and the rest of the association's membership are the uncles and aunties. Today I went round collecting membership forms as well as giving out some. I have different reactions, some positive some hesitant. Overall we have identified many members to participate in our inaugural meeting. I pray that it will be a good meeting. No, change that to a great meeting. "Then we will no longer be infants, tossed back and forth by the waves, and blown here and there by every wind of teaching and by the cunning and craftiness of men in their deceitful scheming. Instead, speaking the truth in love, we will in all things grow up into him who is the Head, that is, Christ. From him the whole body, joined and held together by every supporting ligament, grows and builds itself up in love, as each part does its work." I felt the appropriateness of these verses as we approach the day of reckoning, the day when we elect the committee members to run the Persatuan. As the nominated chairman from the church, Wesley Methodist Church Seremban, I feel this burden of leadership. I look for near perfection in ideals but I am also practical to accept lesser performance because we are human. What is important for now is to have a good team, a caring and supportive team, with the right intentions and the team spirit to support and share the workload with the leader as they together go forward to put Persatuan on a high pedestal of doing good work for the learning disabled. We are a body that needs to grow and be built up. For this my desire is that every part will do its work so that the body may be strong and healthy. I ask that members not fear working, only fear not being found to work when God calls. I believe God is definitely working in our midst. The timing of our anniversary celebration, our registration as a society, newspaper publicity and progress of ticket sales cannot be attributed to chance. 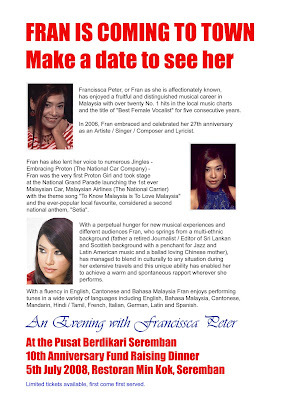 And to have Francissca Peter sing for us is a powerful attraction that drove ticket sales. We are confident of achieving the 100 tables target. Privately, we are challenging ourselves to go beyond. Here are some pictures of the publicity we promote ourselves as well as what the Star Metro central edition did for us yesterday and today. We thank the reporters concerned for the awareness given to this social work.